Mimoco has updated with the release of Star Wars MimoPowerTubes series 2 featuring Yoda, Boba Fett, R2-D2 and Darth Vader’s Lightsaber. Each retails for $29.99 and provides backup battery support for iOS and Android devices. 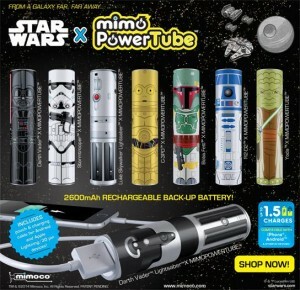 Mimoco (manufacturers of Mimobot) has announced the first product offerings for their new Star Wars MimoPowerBot line of backup battery USB chargers for mobile devices. Head on over to check out Darth Vader and R2-D2 – pre-order now for a $10 discount. Mimobot today unveils their next SDCC Exclusive USB Flash Drive, this time featuring a Chewbacca variant which features a worse for wear C-3PO on the reverse. Limited to 1000 pieces. Mimobot has just revealed that R2-A6 is their newest exclusive flash drive to be released in commemoration of Star Wars Day, May the Fourth. It is available now and limited to 1000 pieces. Head on over to Mimobot for the full details. Mimobot has announced a Limited Edition Jar Jar Binks USB flash drive – which ironically was their April Fool’s Day gag last year. The drive comes preloaded with exclusive Jar Jar Binks Mimory® content including the MimoDesk® personalization suite, which is comprised of Binks-themed wallpapers, icons and avatars. It also comes equipped with MimoByte® sound software, powered with an offering of iconic sounds and character dialogue that play each time a Jar Jar Binks MIMOBOT is inserted or ejected from one’s computer. The Jar Jar Binks Mimobot is limited to 500 pieces. Mimobot today is offering a Limited Edition Hooded Darth Maul Mimobot as part of the May the 4th Celebration. This drive is limited to only 504 pieces so get yours before they are gone! Mimobot.com has announced that Series 7 of their popular line of Star Wars-themed USB portable flash drives is now available. Series 7 consists of Lando Calrissian, Bossk, Boba Fett (ROTJ – battle damaged armor), Leia as Boushh, Han Solo (In Carbonite Carrying Case). Head on over to Mimobot for all the data! Here is a quick update from bigbadtoystore.com!